﻿Members share their musical talents adding a lively spirit to our worship services and programs throughout the year. To learn more about our music opportunities, please contact our Director of Music, Terri Nicotera. 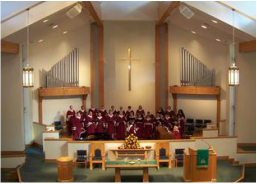 The adult choir sings on Sunday mornings from September - May at the 10:30 am worship service. They sing numerous styles including sacred classical pieces, contemporary praise songs, and spirituals. The choir welcomes new members throughout the year. Musicians of all ages come together to play in the NRPC Orchestra. The NRPC Orchestra continually seeks new ways to enrich our worship service several times during the year. From individual vocalists and instrumentalist to liturgical dancers, there are many ways to share talents during worship. Featured in the past have been clarinets, bagpipes, the harp, string quartets, and many more. All ages and skill levels joyfully participate so that music remains a joyous expression of praise throughout the year.